This is from June 11th, 2010, but the action plan is still available and more relevant than ever. Download the PDF and see the plan. -W.E. Progressive TV and radio star Thom Hartmann took time off from covering Van Jones and his “Rebuild the Dream” movement on Wednesday to briefly talk to this columnist about his relationship with the Vladimir Putin regime of Russia. The conversation quickly went sour when Hartmann objected to questions about how much he is being paid by Moscow. He grabbed my video camera, covering the lens briefly in the process, and stomped away, objecting to “gotcha” questions. The entire spectacle was captured on camera and posted on YouTube. During another embarrassing incident, Van Jones refused to sign a copy of his Standing Together to Organize a Revolutionary Movement (STORM) manifesto when asked to autograph it. “No thank you,” he sternly said before asking, “Who are you?,” looking at my name badge, and walking away to the next adoring crowd of Van Jones groupies. Jones, a “former” communist, is the new face of the progressive movement that is backing the “Occupation Wall Street” protests and is trying to guarantee President Obama a second term. He was fired as Obama’s “green jobs czar” when the truth about his extremist background and statements started to emerge in reports originally by blogger Trevor Loudon and then Glenn Beck on Fox News. While Jones made remarks in his own conference speech about losing his White House job, he also mocked Beck, noting that he had lost his program on the Fox News Channel. Progressives demanded Beck’s ouster after he began exposing billionaire hedge fund operator George Soros, a major funder of the liberal-left. Soros, who operates an off-shore hedge fund with mysterious sources of cash, has just failed in his effort to have the European Court of Human Rights lift his conviction in an insider trading case in France. The STORM document is about the history of a communist group that Jones led and whose members traveled to Cuba. He has, however, tried to leave his communist past behind as he reinvents himself as an American patriot trying to “rebuild the American dream.” At almost every stage of his career, he has been supported by money from Soros. During an extended interview, Joelle Fishman of the Communist Party USA talked about Jones’s leadership in this new phase of the progressive movement and how the conference welcomed socialists and communists. She said the Communist Party, which usually fields a presidential candidate, will not run anyone against Obama in 2012. Communist literature was openly displayed at the conference and the Democratic Socialists of America, a group which backed Obama’s political career from the start, had an information table. Judith LeBlanc, who runs a group called Peace Action and is one of the vice-chairs of the Communist Party, was introduced on stage as one of Van Jones’s “partners” in the “rebuild the American dream” movement. Hartmann, a leader of Progressive Democrats of America, has a show distributed nationwide by Russia Today (RT) television and Free Speech TV. He apparently didn’t grasp the irony of trying to silence a recording device while touting the virtues of the First Amendment. Hartmann spoke to me after participating in a “Taking Back the Media” panel discussion during the Take Back the American Dream Conference sponsored by the Campaign for America’s Future. Hartmann was hailed in an official press release as a key part of Free Speech TV’s exclusive live coverage of the conference, which was held in Washington, D.C. October 3-5. An affiliate of the Campaign for America’s Future, the Institute for America’s Future, is heavily subsidized by Soros. The head of Free Speech TV is Don Rojas, former press secretary to communist Maurice Bishop, the leader of the Caribbean island of Grenada before President Reagan ordered its liberation by American troops in 1983. Rojas, in a taped interview, spoke fondly of the days when he worked for Grenada’s revolutionary government, even signing a copy of an address Bishop had made to the sixth summit of the non-aligned movement in Havana, Cuba, in 1979. Rojas said he helped to write the speech and was in Havana at the time. 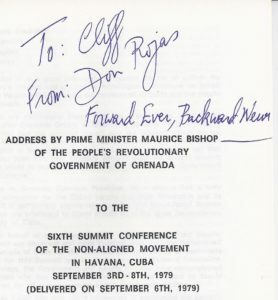 He signed it, “Forward Ever, Backward Never,” an inspirational quotation from Bishop which was supposed to capture the essence of the revolutionary process. Rojas was captured, arrested, and then deported from Grenada by U.S. forces. Today, however, his channel is called the “anti-Fox” network and claims carriage on 200 cable affiliates, Dish Network and DirecTV, reaching 35 million homes. Free Speech TV has been promoting the “Occupation of Wall Street” protests and also distributes Al-Jazeera. Rojas says he has applied for cash from the Soros-funded Open Society Institute (OSI). “We are knocking on the OSI’s door as we speak,” he said. Kampuchea, the communist word for the country of Cambodia, saw a takeover by the communist Khmer Rouge, after America’s defeat in Vietnam, that took the lives of about two million people in a bloody genocide. Iran was taken over by radical Islamists, who remain in charge and are working to obtain nuclear weapons in order to destroy the state of Israel and threaten the U.S.
“Long live the Cuban revolution!” was one of the concluding phrases in the Bishop speech. While Rojas talked openly about his service to Bishop and Castro, AFL-CIO official Karen Nussbaum was close-mouthed in regard to her trip to Cuba in 1970 as a member of the Venceremos Brigades to the communist-controlled island. “No,” she curtly replied, when asked to talk about a trip that reportedly included a meeting with Castro himself. Asked why she wouldn’t talk about it, she said it was “not relevant.” Nussbaum was on a panel discussing feminism that was organized by the Rockefeller Fund. This was the second time I had tried to talk to Nussbaum. She appeared at a previous Campaign for America’s Future conference and turned and walked away when I raised similar questions. This time she had a press representative intervene to say that he would try to get answers to my questions. I am not holding my breath. A published report about Nussbaum’s trip to Cuba said she “was impressed with Castro and with Cuban socialism.” In an oral history of her days as a young radical, Nussbaum talked about the large number of Weathermen in the brigades to Cuba. The Weathermen became a terrorist group, the Weather Underground, after being brainwashed and trained in guerrilla warfare in Cuba by Castro’s intelligence operatives.